Next, we proceed to the State Capitol where protests were happening against the Iraq war (in 2005). According to the History Channel, President George W. Bush declared war in March of 2003 to stop the threat against the United States. The main argument was that Saddam Hussain, was a threat to the United States because he was creating weapons of mass destruction (History, 2003). According to the New World Encyclopedia, Hussain was president of Iraq from 1979 until 2003. During this time, he was president during the Iran-Iraq War and the Gulf War (The New World Encyclopedia, 2014). Hussain went into hiding shortly after the United States declared war (History 2003). He was captured in December of 2003, outside of Tikrit. He was tried in 2004 and found guilty of crimes against humanity in November of 2006. He was executed by hanging December 30, 2006 (The New World Encyclopedia, 2014). During September of 2005, many protests happened asking the government for peace. 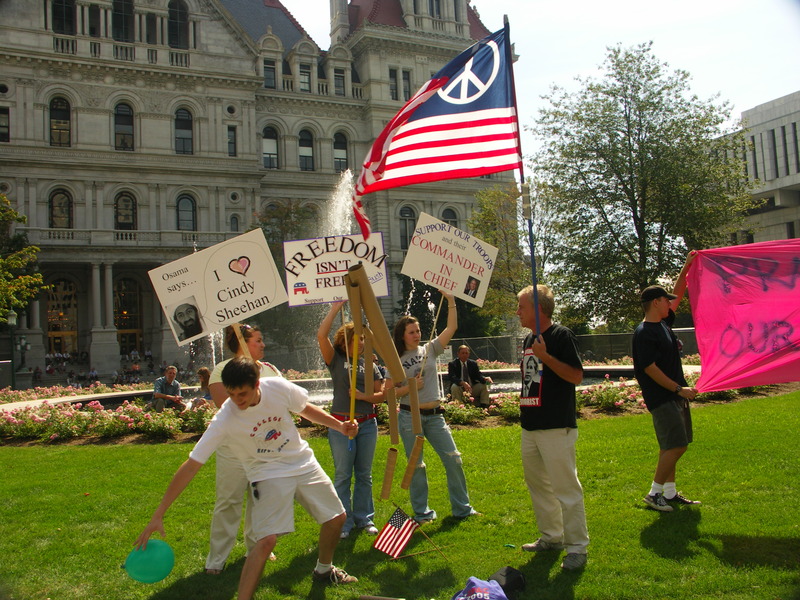 However, this specific protest in 2005, was pro troops. One could see on the signs that many are for George Bush, obviously supporting his idea to go to war. One sign says “Osama says… I [heart] Cindy Sheehan. Washington Post reported that Cindy Sheehan was the mother of a soldier who was killed in Iraq. She responded by creating Gold Star Families for Peace, and began many anti-war protests (Fletcher, 2005). Perhaps this exact protest happened in response to Cindy Sheehan’s protest outside of George W. Bush’s ranch in August of 2005. According to Elaina Quijano of CNN, Sheehan walked half a mile with about fifty protesters on her side, when they were stopped by Law Enforcement. According to the same source, Newsweek held a telephone poll of 1,004 people; 64% said they did not believe the war was making America safer (Quijano, 2005). “Protest at the Capitol,” Albany Walks for Health, accessed April 20, 2019, http://www.albanywalksforhealth.com/items/show/158. “War in Iraq Begins.” History, March 19, 2003. http://www.history.com/this-day-in-history/war-in-iraq-begins. “Saddam Hussein.” New World Encyclopedia, March 2014. http://www.newworldencyclopedia.org/entry/Saddam_Hussein. Fletcher, Michael A. “Cindy Sheehan’s Pitched Battle.” Washington Post, August 13, 2005. http://www.washingtonpost.com/wp-dyn/content/article/2005/08/12/AR2005081201816.html. Quijano, Elaine. “Soldier’s Mom Digs in near Bush Ranch.” CNN, August 7, 2005. http://www.cnn.com/2005/POLITICS/08/07/mom.protest/.